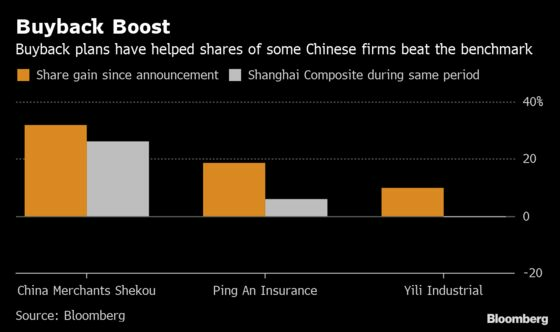 (Bloomberg) -- Investors looking for evidence the rally in China’s stock market will continue may draw comfort from the recent spate of equity buybacks. At least 146 firms bought back shares in the first week of April, according to Sinolink Securities Co., with at least 17 others announcing plans to do so. Inner Mongolia Yili Industrial Group Co., China’s biggest dairy producer, jumped 8.3 percent on Tuesday after saying it would spend 10.6 billion yuan ($1.6 billion) repurchasing as much as 5 percent of its total shares. In addition to suggesting confidence in a company’s performance, buybacks are one way for firms to reward shareholders, something the government has been keen to encourage. Authorities sought to relax rules in November to allow companies to use bank loans and bond sale proceeds when repurchasing shares. Nearly 700 firms bought back shares in December-January alone, according to Bloomberg calculations based on Sinolink data -- compared with 609 companies that did so in 2018 up to early November. For some companies, the goal is to reward employees through stock ownership programs. There is a risk companies will overpay for their shares. In Yili’s case, the dairy firm said it will buy back shares at up to 35 yuan apiece, a price cap that offered a 22 percent premium to the closing price before its announcement. Its shares closed at 30.32 yuan on Thursday. Still, the positive impact on shares can outstrip such concern, according to Wang Chen, a Shanghai-based partner at XuFunds Investment Management Co.
Ping An Insurance Group Co. has gained 17 percent since announcing a 10 billion yuan buyback plan in mid-March. China Merchants Shekou Industrial Zone Holdings Co. has advanced 28 percent since unveiling its plans in mid January.